When it comes to safety, Acura has you covered with a range of different safety features. For drivers in Denver who want additional insurance and peace of mind, there’s AcuraWatch™, available throughout the new Acura lineup. So, what is AcuraWatch™? Let’s take a closer look at what AcuraWatch™ is and how it has been designed to improve your awareness of what’s around your vehicle, while also providing mitigation measures should the unexpected arise. This feature sends out radar signals in front of the vehicle to detect if a potential forward collision might occur. When it detects this possibility, it sends a warning to the driver, and if the driver fails to react then it intervenes by applying the brakes automatically. When cruise control is engaged with this feature, you won’t have to worry about braking and accelerating down crowded Denver streets. Adaptive Cruise Control will maintain a safe distance between your car and the one in front of you. 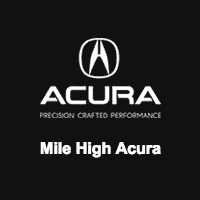 Now that you know what AcuraWatch™ is, you can find an AcuraWatch™-equipped model like the new Acura MDX today in Denver at Mile High Acura. If you have questions for us, reach out online.